The central dogma of molecular biology states that DNA makes RNA makes protein. Discoveries over the last quarter of a century found that the process of DNA transcription into RNA gives rise to a diverse array of functional RNA species, including genes that code for protein and noncoding RNAs. For decades, the focus has been on understanding how protein-coding genes are regulated to influence protein expression. However, with the completion of the Human Genome Project and follow-up ENCODE data, it is now appreciated that only 2–3% of the genome codes for protein-coding gene exons and that the bulk of the transcribed genome, apart from ribosomal RNAs, is at the level of noncoding RNA genes. In this article, we focus on the biogenesis and regulation of a distinct class of noncoding RNA molecules termed long, noncoding RNAs in the context of the immune system. The human genome is pervasively transcribed into protein-coding and noncoding RNA (ncRNA) molecules. We now appreciate that a new subset of noncoding RNA, termed long ncRNA (lncRNA), plays an important role in human development and disease because tens of thousands of polyadenylated and nonpolyadenylated lncRNAs are actively transcribed from the human genome. Early in this conversation, it was argued that noncoding regions of the genome were nothing more than transcriptional noise, in part due to lack of evolutionary conservation across species. However, the absence of evolutionary conservation cannot definitively prove absence of function, and this field has grown to include functional studies documenting the diverse functions of this distinct repertoire of transcripts that are present in humans (1–3). Comparison of sequences across multiple branches of life indicated that many noncoding transcripts, including lncRNA transcripts, are not always shared among multiple taxa and can include lack of conservation among members of the same clade (4–7). Although some lncRNAs have orthologous transcripts across species leading to robust experimental systems, this is not always the case, leaving many lncRNAs explored in animal models unverified in human systems. In this article, we explore the features that give rise to these transcripts and highlight recent work identifying specific genomic loci that transcribe lncRNAs found in the human immune system. The discovery of lncRNAs would not have been possible without the completion of the Human Genome Project that provided the first drafts of a complete reference sequence and refinement of DNA- and RNA-sequencing platforms capable of longer sequence reads and higher read depth and coverage. lncRNAs are distinct from short ncRNAs, including microRNAs, small nucleolar RNAs, and transfer RNAs, because they are >200 nt in length. lncRNAs are similar to mRNAs in that many, but not all, lncRNAs are processed, 5′ capped, and polyadenylated (8, 9). Most lncRNAs are named for the genes they are nearby or for the protein-coding genes that they regulate (10). However, given the large quantity of proposed lncRNA transcripts, a debate has emerged about how to structure the naming convention in a logical and flexible format for cataloging newly discovered lncRNA transcripts (11, 12). lncRNAs are typically classified as overlapping when a protein-coding gene is encompassed by the intron of an lncRNA, bidirectional or divergent when the Long intergenic noncoding RNA (lincRNA) and nearby protein-coding gene are transcribed on opposite strands, intronic when the entire sequence of the lncRNA falls within the intron of a protein-coding gene, intergenic when an lncRNA sequence falls between two genes as a distinct unit, and sense or antisense if the lncRNA is mapped between one or more exons of another transcript on the same (sense) or opposite (antisense) strand (11, 13, 14). Finally, enhancer RNAs (eRNAs) are transcribed in one or two directions at genomic transcriptional enhancers, oftentimes in close proximity to protein-coding genes (15). The specifics of eRNAs are discussed later in this review. Fig. 1 shows the spatial and genomic locations of proximal lncRNA types. lncRNAs across each of these subclasses can have similar modes of action. Thus, the naming conventions often provide more information about position than function in the broad sense, but descriptors can be added to assist recall of the biology ascribed to each novel lncRNA. It is also important to remember that the term lncRNA itself is a very broad term conveniently ascribed to a transcript > 200 bp in length that does not appear to code for protein (11, 16). In fact, several early lncRNAs recently were shown to code for small proteins and even were found to play a role in enhancer function (17, 18). Thus, a one-size-fits-all designation of lncRNA has been questioned, and other designations were suggested, including the terms transcripts of unknown functions and transcriptionally active regions (11, 19–21). For now, lncRNA remains the accepted convention (11, 14). lncRNA and eRNA architecture. (A) eRNAs (red exons) are transcribed in one direction (1d-eRNA) or two directions (2d-eRNA) in close genome proximity to known protein-coding genes. Divergent lncRNAs (blue exons) are transcribed in the opposite direction from known protein-coding genes. Overlapping RNAs (purple exons) encompass the entirety of protein-coding genes in an intron region of the full-length lncRNA transcript. (B) Intronic lncRNAs (green exons) fall within an intron of a protein-coding gene. Sense and antisense lncRNAs (gold exons) are transcribed along the same (sense) or opposite (antisense) strand of the protein-coding gene. Exons from antisense lncRNAs are often partially shared. (C) Intergenic lincRNAs (pink exons) fall between known protein-coding genes and often regulate expression of these nearby mRNAs. (A–C) Gray arrows indicate the direction of gene transcription. Square boxes represent gene exons that are spliced to form mature transcripts for the indicated RNA species. PC, protein-coding gene. Expression of many lncRNAs exhibits greater cell-type specificity than lineage-specific protein-coding genes, including those that encode lineage-specific transcription factors; this specificity appears to be tightly controlled because these same lncRNAs are found in close proximity to key protein-coding gene loci with tissue-specific function (22–24). A comparison of human lncRNA expression patterns in nine tissues across six mammalian species found that tissue-specific expression patterns of lncRNAs and lncRNA promoter sequences are also conserved at a rate of 35% across mammals. Twenty percent of the lncRNAs identified in human are not conserved beyond chimpanzee, and several were found to be absent in rhesus (25). Thus, although a percentage of lncRNAs are conserved, many are subject to evolutionary turnover. With this in mind, a number of lncRNAs have been described in animal models, such as mice, but these initial studies often require follow-up to validate findings in human systems. lincRNA–cyclooxygenase-2 (lincRNA-Cox2) is an example. lincRNA-Cox2 represses IFN-response genes by physical association with the heterogeneous nuclear ribonucleoproteins (hnRNPs) hnRNP-A/B and hnRNP-A2/B1 (26–28). Reduced levels of lincRNA-Cox2 block the synthetic Pam(3)CysSK(4)-mediated TLR induction of Il6, Tlr1, and Il23a via NF-κB– and MyD88-dependent pathways that respond to TLR2 pathway activation. A recent study also found that lincRNA-Cox2 epigenetically modulates Il12b gene transcription by recruiting the Mi-2/nucleosome remodeling and deacetylase repressor complex in murine intestinal epithelial cells following stimulation with TNF-α. Thus, lincRNA-Cox2 was found to play important roles in inflammatory responses in two murine cell types. Despite studies in murine cells, the mechanism of action for this lncRNA remains to be validated in the context of the human immune system. Across species, lncRNAs may have diverse functional repertoires, but their function often follows common themes. lncRNAs often serve as scaffolds, decoys, epigenetic regulators, and enhancers (17, 29, 30). As scaffolds, lncRNAs bring together two or more proteins into RNA–protein complexes. lncRNAs with decoy functions titrate away DNA-binding proteins from DNA, including transcription factors. Epigenetic regulation via lncRNAs occurs when lncRNAs bind to chromatin-modifying proteins and recruit their catalytic activity to specific genomic sites, leading to modulation of chromatin states and changes in the expression of nearby genes (31). 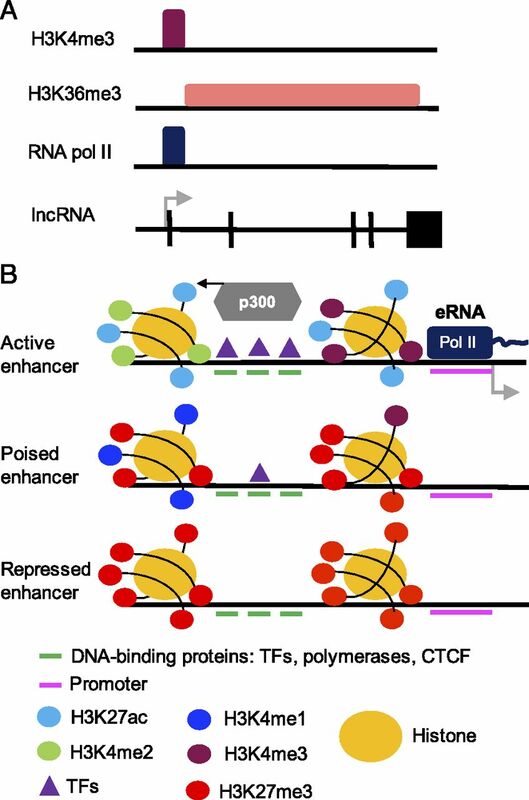 lncRNAs with enhancer function act in cis, and chromosomal looping brings them into close proximity with the genes that they activate or repress (14). We explore several lncRNAs that give rise to specific cell types and others that have been studied in the context of human systems and highlight a few of the human lncRNAs that have been implicated in disease pathogenesis. The study of lncRNAs in human model systems relies on transfection systems capable of achieving measurable knockdown of target lncRNA species. These studies can often be complicated by the presence of unique isoforms for the same lncRNA. Relevant spliced EST sequence information is critical for mapping the diversity of lncRNA species that can be present in a specific genomic region. For example, a Th2-specific cluster of lncRNAs, TH2LCRR lncRNAs, was identified in the 3′ end of RAD50 in a study comparing differentially expressed novel and annotated lncRNAs in Th1-, Th2-, and Th17-polarized cells (32). This cluster of four antisense lncRNAs was found to regulate Th2 cytokines, including IL-4, IL-5, and IL-13. Knockdown of individual alternatively spliced TH2LCRR transcripts using small interfering RNAs (siRNAs) resulted in a modest reduction of these Th2-associated cytokines. However, transfection of an siRNA targeting the shared region of all four of these transcripts significantly abrogated IL-4, IL-5, and IL-13 expression. Further, transfection of the siRNA targeting the shared TH2LCRR region reduced H3K4me3 and WDR5 binding, as determined by chromatin immunoprecipitation (ChIP), at the IL4 and IL13 promoter, IL4 intron, and IL4 and IL13 distal conserved regions. Thus, these studies demonstrated that TH2LCRR transcripts facilitated recruitment of WDR5-containing complexes to these genomic elements and production of H3K4me marks at Th2-specific gene loci. Had information on the shared sequence not been available, it is likely that these studies would not have been possible. However, using existing spliced EST sequence information, it was possible to target all members of the TH2LCRR family and observe significant changes in Th2-specific gene activity (6). These studies highlight the need for careful mapping of lncRNA sequences when attempting to ascribe biology to candidate lncRNAs. Nettoie Theiler’s Pas Salmonella (IFNG-AS1). Nettoie Theiler’s Pas Salmonella (NeST) was the first enhancer lncRNA found to influence expression of the master cytokine IFN-γ (33–35). NeST, also referred to as TMEVPG1 or IFNG-AS1, is necessary for induction of Ifng gene transcription via canonical Th1 Stat4 and T-bet transcription factor–mediated pathways, as well as through NF-κB and Ets1 binding to distinct genomic regions to recruit H3K4 histone methyltransferase to the Ifng locus. IFNG-AS1 also was studied in human systems. PCR and RNA-sequencing studies confirmed that levels of human IFNG-AS1 are also differentially expressed in Th1 cells compared with Th2 or Th17 cells (32). Although IFNG-AS1 is transcribed antisense to IFNG in mouse and human, unique isoforms have been found in both species. Both species exhibit a cluster of transcripts that is ∼200 kb from IFNG. However, the annotated human IFNG-AS1 also consists of an isoform that spans this entire region, with the 3′ end terminating between IL22 and IL26. In animal models, loss of IFNG-AS1 expression results in an inability to mount an effective immune response to bacterial or viral pathogens, including Salmonella infection or Theiler’s virus infection. Interestingly, subjects with the autoimmune condition Hashimoto’s thyroiditis (HT) expressed increased levels of IFNG-AS1 that positively correlated with elevated production of thyroglobulin and thyroid peroxidase autoantibodies (36). These autoantibodies contribute to thyroid destruction via activation of complement. siRNA treatment of Th1 cells isolated from HT patients reduced levels of IFNG. It remains to be examined whether elevated levels of IFNG-AS1 could serve as a biomarker of disease activity in HT subjects. NFAT is a transcription factor that is regulated by levels of intracellular Ca2+. As intracellular stores of calcium rise, NFAT is dephosphorylated by calcineurin, leading to translocation of NFAT to the nucleus. Studies involving human T cell lines and primary T cells identified NRON as a cytoplasmic repressor lncRNA that functions to regulate NFAT and modulate IL-2 gene activity in activated T cells (37, 38). In unstimulated cells, NRON forms an RNA–protein complex consisting of the calmodulin-binding protein IQGAP1 and the nuclear transport protein KPNB1, a member of the importin-β family. NRON serves as a structural scaffold that sequesters inactive phosphorylated NFAT. Depletion of IQGAP1 and NRON exhibit increased levels of NFAT target genes, including IL-2. Recently, NRON was shown to suppress viral transcription of HIV-1 by reducing levels of the viral transactivator protein Tat (39). NRON facilitates the degradation of Tat by directly linking this protein to the proteasome-ubiquitin components PSMD11 and CUL4B. This linkage leads to degradation of the protein complex. This report provides evidence that by reducing Tat levels, NRON can block the transcriptional activity of proviruses. The activity of this lncRNA in the context of other viral infections remains to be examined. To determine whether LPS treatment of human cells induced known lncRNAs, THP-1 cells were stimulated with LPS, and expression of lncRNAs was measured using predesigned microarrays (40). Real-time PCR was used to validate microarray findings in THP-1 cells and in human PBMCs. Treatment with LPS or Pam(3)CysSK(4), a TLR2 agonist, markedly induced a novel sense transcript, lnc-IL7R. lnc-IL7R is transcribed from the 3′ untranslated region of the IL7R gene such that lnc-IL7R and IL7R share the same poly-A tail. Transfection of an siRNA targeting lnc-IL7R in LPS-treated cultures dampened the LPS-mediated inflammatory response causing decreased expression of adhesion molecules E-selectin and VCAM-1 and proinflammatory cytokines IL-6 and IL-8. Trimethylation of histone H3 at lysine 27 (H3K27me3) is a mark of transcriptional repression on chromatin. H3K27me3 marks are reduced in E-selectin and VCAM-1 genes in LPS-stimulated cells, and downregulation of lnc-IL7R reduced levels to a greater extent than did LPS treatment alone. These data suggest that lnc-IL7R functions as a negative regulator of the inflammatory response induced by LPS. Using a custom-designed microarray combining Ensembl and Havana annotations for known lincRNAs, it was found that a panel of 159 lincRNAs was differentially expressed upon innate activation with the TLR2 agonist Pam(3)CysSK(4) in THP1 cells (41). From these 159 lincRNA transcripts, one lincRNA (linc1992) was expressed across multiple human tissues and was required for expression of the proinflammatory cytokine TNF-α. TNF-α protein and mRNA expression were reduced in cells treated with a short hairpin RNA against linc1992. Regulation of TNF-α by linc1992 was through a physical association of linc1992 with hnRNPL, and this complex regulated the transcription of TNF-α by binding to the gene promoter. Thus, the investigators named linc1992 THRIL (TNF-α and hnRNPL related immunoregulatory LincRNA). Of particular interest, the investigators further associated THRIL with Kawasaki disease by measuring the expression of THRIL in peripheral whole blood in a case/control study. Although the sample size was relatively small, the results nonetheless associate a lincRNA with inflammatory disease (42). In humans, Mycobacterium tuberculosis infection induces CD244 signaling in CD8+ T cells, and reduced CD244-mediated signaling increases IFN-γ and TNF-α production by CD8+ T cells. Using primary human samples and mouse models, lncRNA-CD244 was identified as a nuclear lncRNA expressed in human CD8+ T cells in subjects with M. tuberculosis infection that mediates gene expression through epigenetic reprogramming (43). CD8+ T cells from patients with M. tuberculosis infection were isolated, and siRNAs against lncRNA-CD244 were transfected into these cells. The investigators measured levels of H3K9me1, H3K9me2, H3K9me3, H3K27me3, and H3K4me3 at IFNG and TNFA loci. It was observed that transfection of an siRNA targeting this lncRNA led to a significant increase in H3K4me3 and H3K9me1 marks and a significant reduction in H3K27me3 at these gene loci. Further, CD244 signaling in active M. tuberculosis infection represses TNF-α and IFN-γ via modulation of polycomb protein enhancer of zeste homolog 2 (EZH2), a histone modification enzyme, at the promoters of TNFA and IFNG, enabling the formation of H3K27 methylation marks and repression of gene expression. siRNA treatment or introduction of a lentiviral vector abrogating lncRNA-CD244 expression blocked recruitment of EZH2 to the TNFA and IFNG promoters and caused a shift from heterochromatin to euchromatin at these promoters, leading to transcription of both genes. lncRNAs induced by viral infection also were shown to regulate gene expression. Polyadenylated nuclear (PAN) RNA is encoded by Kaposi’s sarcoma virus (KSHV) and evades the human immune response by altering the expression of IFN-γ, IL-18, and αIFN-16 and by interfering with IRF4/PU.1 to activate the IL4 promoter (25, 43). PAN RNA also associates with the polycomb repressor complex PRC2, resulting in the silencing of many host immune response genes. Lytic activity induced by PAN RNA arises from a physical interaction with the ORF50 promoter, leading to reduced repressive H3K27me3 marks and interaction with two demethylases (UTX and JMJD3) and the histone methyltransferase MLL2 (45). The data suggest that PAN RNA increases KSHV expression by serving as a molecular scaffold recruiting chromatin-modifying enzymes to gene loci, leading to removal of H3K27me3 marks and KSHV activation. In a series of independent experiments, PAN RNA was also shown to bind latency-associated nuclear Ag, removing it from the KSHV genome and contributing to the change from latent to lytic infection (46). Mutations of the RMRP gene in humans result in cartilage-hair hypoplasia, a genetic disorder leading to dwarfism, an increased likelihood to develop lymphoma, and immune deficiency. In mice, alterations in the Rmrp gene lead to defective Th17 effector cytokine production (47). Screening for protein partners of RORγt using mass spectrometry identified DDX5, an RNA helicase that was found to be essential for the regulation of RORγt target genes. Abrogation of DDX5 reduced Th17 cell function and indices of inflammation across two mouse models, including the EAE model for multiple sclerosis and inflammatory bowel disease using a T cell transfer model of colitis that depends upon RORγt expression. The RNA-helicase domain was found to be essential for Th17 cytokine production and led to the identification of an lncRNA, Rmrp, that was bound to DDX5 and RORγt. Using chromatin isolation by RNA purification, it was discovered that lncRNA Rmrp associates with specific genomic loci that overlap with RORγt-, RNA polymerase II–, and H3K4me3-bound loci. In lncRNA Rmrp-knockout mice, Rmrp association with RORγt-bound sites was reduced significantly. Similarly, in DDX5-deficient mice, polarization of CD4 cells under Th17 conditions led to a significant decrease in lncRNA Rmrp marks at RORγt-bound genomic loci. Thus, lncRNA Rmrp is a critical regulator of Th17 effector function in tissue culture and in animal models of autoimmunity. This study also found that this lncRNA appears to be conserved in human systems. In human Th17 cells, reduced levels of lncRNA Rmrp led to a significant reduction in IL-17a. lncRNA Rmrp could present an attractive target for treatment of immune deficiencies like cartilage-hair hypoplasia. These studies could also be extended to therapeutic management of autoimmune disease. In mammalian cells, the nucleus contains 10 types of nuclear bodies, including speckles and paraspeckles, which are critical components of gene regulation (48). Within these genes bodies are a number of lncRNAs that regulate their function (49). NEAT1 is a 4-kb transcript that displays high sequence conservation but is not spliced or polyadenylated (26, 50, 51). NEAT1 is required for the formation of nuclear paraspeckles found in the nucleus’ interchromatin space and expression of IL-8. As NEAT1 is induced, antiviral gene transcription increases, including the induction of cytokines like IL-8. Using ChIP assays, it was shown that the splicing factor proline/glutamine-rich (SFPQ) represses IL-8 transcription by binding to the IL8 promoter. SFPQ and NONO form a heterodimer that binds directly to NEAT1. NEAT1 relocates one of these proteins, SFPQ, away from the IL8 promoter to the paraspeckles, leading to transcriptional activation of IL-8. NEAT1 is activated by HSV and influenza virus, as well as by the TLR3–p38 pathway ligand polyinosinic-polycytidylic acid, and leads to excess formation of paraspeckles, suggesting a role for it in viral clearance. NEAT1 was also among the first lncRNAs implicated in HIV infection (52). NEAT1 is induced (>5-fold) in T cells infected with HIV-1. Using antisense DNA and siRNA experiments, knockdown of NEAT1 led to increased transcription of HIV-1 by increasing nucleus-to-cytoplasm export of Rev-dependent, HIV-1 INS-containing, unspliced transcripts. ASP-L is a 2.6-kb nuclear nonpolyadenylated lncRNA that regulates transcriptional activity of the HIV-1 promoter (53). The ASP-L promoter falls within the envelope U5 region of the 3′–long terminal repeat (LTR) of HIV and is transcribed antisense to HIV-1 into two variants: a major variant (ASP-L1) and a minor variant (ASP-L2) (26, 54). Overexpression of ASP-L results in reduced viral replication, and it was shown that ASP-L interacts with the U3 region of the 5′-LTR to reduce transcription of HIV-1 mRNA. Epigenetic silencing of HIV-1 transcription by ASP-L also was demonstrated, suggesting that ASP-L acts as a guide lncRNA to facilitate recruitment of epigenetic silencing factors, including DNA methyltransferase 3A and histone deacetylase 1, to the HIV-1 promoter (5′-LTR). This results in the formation of heterochromatin shown by increased H3K9 dimethylation, histone deacetylation, and H3K27me3 that effectively shut down HIV-1 transcription. Collectively, these studies may provide clues about how HIV-1 latency and reactivation are modulated. The expression patterns and functions of these lncRNAs are summarized in Table I. The history of lncRNA discovery finds its origins in a series of chromatin marks that were identified using massively parallel sequencing following ChIP looking for DNA–protein complexes. These sequencing studies identified DNA sites occupied by histones and their modifications. This revealed the first clues about genomic architecture, including the identification of RNA polymerase II–transcribed genes that were occupied by H3K4me3 marks at promoters, followed by histone H3 lysine 36 trimethylation along the transcribed gene (K4–K36 domains) (55, 56). From these early studies in mice and humans, it was determined that thousands of intergenic lncRNAs exist. Early on in the study of lincRNA genes, size, lack of coding potential, and conservation of the introns and intergenic regions found in lincRNAs across multiple branches of life suggested a functional RNA gene (14). Indeed, analysis of the promoters showed highly conserved regions that recruit binding and direct regulation of important transcription factors. These early lincRNAs also exhibited synteny across species and shared genomic locations that have been interpreted as indications of conserved functions (57–60). Although this was the case for several lincRNAs, in the intervening years of lncRNA discovery, it is now understood that many lncRNAs are poorly conserved compared with mRNAs, making translational studies from humans into model species, such as mice, challenging. It is estimated that more than one third of all lincRNAs are associated with chromatin-modifying complexes that give rise to key cellular processes, including pluripotency, modulation of the immune response, or regulation of apoptosis and cell cycle arrest (14). RNA-sequencing has permitted the identification of multiple transcript isoforms at a particular gene locus, facilitating a multilayered approach to RNA gene annotation. Many of these technologies now permit the preservation of strand orientation, and the use of bioinformatics tools, such as Bedtools, can facilitate the creation of sense and antisense sequencing files for visualization using freely available tools, including the Integrated Genome Viewer (Broad Institute) or SeqMonk (Babraham Bioinformatics) (61–63). Using a guilt-by-association approach, it is common to compare mapped RNA-sequencing reads with DNase hypersensitivity sites and libraries of ChIP-sequencing data delineating RNA polymerase II binding or H3K4me3 marks at the promoter and H3K36me3 marks along the transcribed RNA to enable the determination of 5′ and 3′ ends of candidate transcripts (14). Read depth is critical because more reads reveal isoform differences that may be omitted if too few reads are performed for a given cell or tissue type. It is also suggested to follow candidate lncRNA catalog assembly with 5′ capture sequencing (cap-analysis gene expression) and cloning to define the ends and specific transcripts selected for a particular study (1, 11, 21, 56, 64, 65). Following identification of candidate lncRNA transcripts, the next challenge is to determine protein-coding potential. Analysis of open reading frames by comparing newly identified sequences with protein domain database annotations, including PFAM, is recommended, particularly if the genome is well-annotated, such as the existing human annotation (8, 66). A number of tools, including PhyloCSF, Coding Potential Calculator, and Coding Potential Assessment Tool to name a few, are available to analyze the sequence and determine whether it is unlikely that transcripts code for functional proteins (67, 68). A new tool, slncky, published by Garber and colleagues (69), produces lncRNA lists from RNA-sequencing data and ranks these candidate lncRNAs in order of functional importance. slncky also screens discovered lncRNAs against known pseudogenes, coding genes, and artifacts from assembly and can assess the creation of small peptides or novel proteins (69). Protein-coding genes are under evolutionary pressure to retain amino acid content, giving rise to proteins that are essential for cellular functions (14). Thus, programs, including PhyloCSF, determine the conservation of a candidate human lncRNA sequence by comparing the sequence product with genome annotations in up to 58 mammalian species (70). Higher PhyloCSF scores correlate with an increased likelihood that a sequence may code for a functional protein and, thus, should be questioned as a true ncRNA sequence. Coding Potential Calculator and Coding Potential Assessment Tool are support vector machine-based approaches that compare known protein-coding and noncoding transcripts against lncRNA candidate sequences to determine whether a sequence is likely to be transcribed into a functional protein (67, 68). No single tool has been unequivocally proven to rule in or rule out protein-coding potential for a candidate lncRNA. However, tools such as these are considerable advances in the study of lncRNAs. It is generally accepted by the field that a number of tools should be used in any computational pipeline for assessing coding potential and determining whether a novel sequence should be classified as an lncRNA. In addition to bioinformatics assessments, the physical location of an lncRNA and information about the structure of the lncRNA can inform the identification of bona fide lncRNA transcripts. For instance, lncRNAs that are associated with chromatin or are located in the nucleus or subnuclear domains and have little or no evidenced protein-coding potential are less likely to give rise to proteins and are more likely to have some structural or regulatory function. It is recommended that in situ hybridizations be performed to assess the distribution of candidate lncRNA transcripts in a cell- and tissue-specific manner (11). Finally, determination of function involves a number of approaches that are still very much evolving, including RNA immunoprecipitation followed by massively parallel sequencing and RNA antisense purification–DNA/mass spectrometry, which are transcript Ab capture procedures that allow for the identification of lncRNA–protein interactions. RNA antisense purification–DNA permits the identification of RNA chromatin–binding regions, and RNA affinity assays, like chromatin isolation by RNA purification, permit the determination of novel regions in the genome where lncRNAs bind to DNA (71–75). Understanding these interactions is critical for elucidating function and developing tools that could predict lncRNA function based on the patterns that emerge. Given that lncRNAs were found to regulate transcription of protein-coding genes in close genomic proximity by recruiting chromatin-modification proteins to DNA, recent work by Werner and Ruthenburg (76) sought to determine a global context for lncRNAs in the nuclear fraction of human HEK293 cells that were bound or tethered to chromatin by RNA polymerase II. The majority (>80%) of the chromatin-enriched RNAs (cheRNAs) that they found were not present on previously published Broad, GENCODE, or RefSeq lncRNA lists. The cheRNAs discovered in this study were tightly correlated with nearby protein-coding gene expression to a greater extent than other eRNAs or annotated lncRNAs that had been published for this human cell line. This could offer a powerful tool to examine cis-gene regulatory activity via examination of nearby cheRNAs. To this end, the investigators also examined known lncRNAs that were found to act in trans but found only a moderate enrichment of these transcripts bound to chromatin. To further define these transcripts as a discrete class of ncRNAs, cheRNAs were compared with previously defined eRNAs in HEK293 cells. Werner and Ruthenburg found that cheRNAs do not overlap with known eRNAs (10.9% overlap) compared with 6.2% estimated by chance (76). Therefore, the investigators argue that cheRNAs are distinct from eRNAs because, unlike eRNAs that exhibit bidirectional transcription from enhancers marked by H3K27Ac and H3K4me1, cheRNA loci are marked by H3K4me3. This closely resembles the chromatin architecture of mRNAs and previously described lncRNA transcription start sites. cheRNAs isolated from the chromatin pellet extracts were also significantly larger than most of the previously characterized eRNAs because the investigators cited a median length of ∼350 total bp compared with the average 2.11-kb length of cheRNAs. Finally, only slightly greater than half (58%) of the eRNAs examined were found to be associated with chromatin. These investigations provide tools for future exploration of distinct lncRNA classes, eRNAs and cheRNAs, in different cell systems. eRNAs are a class of cis-acting lncRNAs that often correlate with nearby mRNA expression. eRNAs exhibit high degrees of tissue specificity and often lack conservation across species (77). eRNAs exhibit a physical association with the genomic locus that encodes them, leading to two distinct opportunities for gene regulation during or immediately after eRNA transcription (78). Although eRNAs are similar in size to lncRNAs, they are often excluded as a specific class of lncRNA in databases, including GENCODE. This is due, in part, to the cell type–specific nature, abundance, and stability of these RNAs (78). Studies of this particular class of lncRNAs in diseases of the immune system have been initiated, but much remains to be explored. Active chromatin states can lead to the induction of numerous lncRNA transcripts. Genome-wide mapping using ChIP to identify enhancer-associated histone modifications, such as H3K4me1 and H3K27Ac, and enhancer-binding proteins, such as p300, identified a variety of lncRNA transcripts produced at these transcriptional-enhancer regions in the human genome (15, 79). eRNAs are a large class of ncRNA transcripts that share similarities and differences with previously discovered lncRNAs, yet the exact definition of an eRNA, as well as its context in relation to other lncRNA species, is incompletely understood. In contrast to canonical lncRNA genes, loci that transcribe eRNAs have increased levels of H3K4me1 marks and decreased levels of H3K4me3 marks (80). These eRNA-transcribing regions are also bound by lineage-determining transcription factors that regulate cell identity. eRNAs also recruit ATP-dependent nucleosome-remodeling complexes that permit histone-modification complexes to form. This enables the deposition of marks demarcating an enhancer region (H3K4me1/H3K4me2) (81, 82). H3K27Ac marks also correlate positively with active enhancers in comparison with enhancers that are poised, lack these acetylation marks, and were associated with H3K27me3 marks instead. Genomic regions that actively transcribe eRNAs almost always lack the H3K27me3 marks that identify promoters (83, 84). There are two distinct eRNA archetypes: unidirectional eRNAs (1d-eRNAs) and bidirectional eRNAs (2d-eRNAs) (15, 79). 1d-eRNAs are >3–4 kb in size and have a poly-A tail (84). 2d-eRNAs are often <2.0 kb in length but >500 bp and are not polyadenylated. A third class of potential eRNAs, termed ncRNA-activating transcripts, was identified and has been annotated in databases, including GENCODE; they average ∼800 bp in length (85). Some studies suggested that these ncRNA-activating transcripts display enhancer-like activity and regulate nearby protein-coding genes similar to eRNAs; however, it remains to be determined whether these transcripts more closely align with eRNAs or other classes of lncRNAs because these transcripts are processed, and their loci bear H3K4me3 and H3K36me3 marks, suggesting a close similarity to 1d-eRNAs. Compared with lncRNAs, loci that transcribe eRNAs have very low levels of H3K4me3 marks. This correlates with their weak expression because eRNA transcripts can have expression levels that are 10–100-fold lower overall compared with the lncRNAs that have been elucidated thus far (14). Although the half-life of eRNAs tends to be shorter than other ncRNAs, including lncRNAs, or protein-coding genes, they are dynamically regulated by signaling events, including signals mediated by critical transcription factors, such as NF-κB and p53 (15, 26, 86). eRNAs are also induced in the immune response. One example of this was reported by Ilott and colleagues (87–89), in which 76 eRNAs were found to be activated in response to LPS stimulation. These eRNAs were identified based on the ratio of H3K4me3/H3K4me1 marks at their underlying genomic loci to distinguish these RNAs from other transcripts. In the same study, they found that reduced levels of IL1B-RBT46, a 2d-eRNA upstream of IL1B mRNA, could decrease IL1B and CXCL8 transcript and protein expression (26, 90). A second example is LUNAR1. LUNAR1, transcribed from the insulin-like growth factor 1 receptor (IGF1R) gene locus, was associated with T cell acute lymphoblastic leukemia (91). LUNAR1 activates the gene locus in cis by a chromosome-looping mechanism involving Mediator/MLL complexes that lead to elevated IGF1 signaling and T cell expansion. Tools that are capable of monitoring and manipulating these regions of the genome encoding eRNAs, including GRO-Seq coupled with Cas9/Crispr deletions, will allow for mechanistic studies to probe the biological functions of individual eRNA candidates. Epigenetic differences between lncRNA and eRNA loci are highlighted in Fig. 2. Histone-binding patterns at lncRNAs and enhancers. (A) Canonical overlapping H3K4me3, H3K36me3, and RNA polymerase II binding at the promoter of lncRNAs. (B) Histone mark patterns delineate regions with active, poised, or repressed enhancers. eRNAs are enriched in areas of the genome that overlap with active enhancers. These regions of active enhancers exhibit high levels of transcription factor and chromatin regulator binding, such as the transcriptional coactivator Mediator (78). Reduced expression of eRNAs at these regions can cause changes in gene expression that suggest that enhancers generate eRNAs essential for activation of gene transcription. Further, eRNAs may function to recruit transcription factors or facilitate enhancer–promoter looping to specific enhancers. An emerging distinction is between two classes of transcriptional enhancer elements: the super enhancer and the typical enhancer. As discussed, enhancers are critical for regulation of gene expression and give rise to transcriptional programs that drive cell identity. In mammalian cells, thousands of enhancers are active, and up to 1 million enhancers were postulated to be active in all human cells (92). Super enhancers are clusters of typical enhancers marked by a very high density of the p300 histone acetyltransferase and H3K27Ac (93–95). Transcription factor density at these regions is also particularly high and these regions are particularly sensitive to perturbation of Mediator and members of the bromodomain and extraterminal subfamily of bromodomain proteins (93, 95). Super enhancers are often situated in close genomic proximity to key genes in the experimental systems that have been studied, particularly in cancer, because loss of super enhancer activity can modulate MYC oncogene transcription and arrest the growth of tumor cells. BRD4 is a critical component for establishing transcription at super enhancer locations through recruitment of RNA polymerase II. Treatment with the BRD4 inhibitor, JQ1, leads to loss of transcription of nearby genes at super enhancers (95, 96). Work by O’Shea and colleagues (97) further defined that the p300 super enhancer architecture can be extended to cells of the immune system and is also found in regions of the genome that are associated with the risk for human disease, including the inflammatory disease rheumatoid arthritis. Therefore, it will be interesting to consider the diversity of the transcripts that are present at regions bearing this super enhancer structure and how regions might respond to treatment with JQ1 to alter cell identity. With powerful genomic techniques, such as RNA-sequencing, becoming increasingly user-friendly, it is important to remember that no one-size-fits-all model can be applied across all experimental and cell type–specific systems. lncRNAs are often cell type specific, and the functions of individual lncRNAs can be diverse. For instance, lincRNA-p21, a downstream intergenic mediator of p53 activation, has had up to four mechanisms of action ascribed to it since it was discovered in 2010 (6, 7). Given the stimulus- and cell type–specific nature of lncRNAs, it is logical to assume that the number of lncRNAs discovered in humans may soon far exceed the number of protein-coding genes. As the field continues to study these molecules, it will be important to leverage a multidisciplinary approach to strengthen the case that candidate transcripts are indeed lncRNAs until the field can work together to establish a codified system of rules. Further, given that the majority of single-nucleotide polymorphisms associated with human disease exist in noncoding gene regions, it is important that we work toward understanding the impact that these alterations in the genome have on ncRNA transcripts. We apologize for omission of work by colleagues in the field of lncRNA biology due to oversight or limitations in space. This work was supported by National Institutes of Health Grants R01 AI04492 and R43 AI124766. The content of this work does not necessarily reflect the views or policies of the National Institutes of Health. The sponsors had no role in the study design, data collection and interpretation, manuscript preparation, or submission of the article for publication. Clark, M. B., P. P. Amaral, F. J. Schlesinger, M. E. Dinger, R. J. Taft, J. L. Rinn, C. P. Ponting, P. F. Stadler, K. V. Morris, A. Morillon,et al. 2011. The reality of pervasive transcription. PLoS Biol. 9: e1000625; discussion e1001102.
. 2013. Pervasive transcription of the human genome produces thousands of previously unidentified long intergenic noncoding RNAs. PLoS Genet. 9: e1003569.
. 2015. Long noncoding RNAs: a potent source of regulation in immunity and disease. Immunol. Cell Biol. 93: 277–283.
. 2010. Mining mammalian transcript data for functional long non-coding RNAs. PLoS One 5: e10316.
. 2012. Emerging functional and mechanistic paradigms of mammalian long non-coding RNAs. Nucleic Acids Res. 40: 6391–6400.
. 2016. Long noncoding RNAs in T lymphocytes. J. Leukoc. Biol. 99: 31–44.
. 2015. Long non-coding RNAs in innate and adaptive immunity. Virus Res. 212: 146–160.
. 2015. The landscape of long noncoding RNAs in the human transcriptome. Nat. Genet. 47: 199–208.
. 2015. The landscape of long noncoding RNA classification. Trends Genet. 31: 239–251.
. 2011. Genomewide characterization of non-polyadenylated RNAs. Genome Biol. 12: R16.
. 2015. Discovery and annotation of long noncoding RNAs. Nat. Struct. Mol. Biol. 22: 5–7. 2014. A short guide to long non-coding RNA gene nomenclature. Hum. Genomics 8: 7.
. 2012. Modular regulatory principles of large non-coding RNAs. Nature 482: 339–346.
. 2012. Genome regulation by long noncoding RNAs. Annu. Rev. Biochem. 81: 145–166.
. 2014. Enhancer RNAs and regulated transcriptional programs. Trends Biochem. Sci. 39: 170–182. 2014. The functional role of long non-coding RNAs and epigenetics. Biol. Proced. Online 16: 11.
. 2015. Linking RNA biology to lncRNAs. Genome Res. 25: 1456–1465.
. 2015. A micropeptide encoded by a putative long noncoding RNA regulates muscle performance. Cell 160: 595–606.
. 2013. Long antisense non-coding RNAs and the epigenetic regulation of gene expression. Biomol. Concepts 4: 411–415.
. 2011. A global transcriptional analysis of Plasmodium falciparum malaria reveals a novel family of telomere-associated lncRNAs. Genome Biol. 12: R56.
. 2004. Global identification of human transcribed sequences with genome tiling arrays. Science 306: 2242–2246.
. 2015. Long non-coding RNA profiling of human lymphoid progenitor cells reveals transcriptional divergence of B cell and T cell lineages. Nat. Immunol. 16: 1282–1291.
. 2015. Comprehensive identification of long non-coding RNAs in purified cell types from the brain reveals functional LncRNA in OPC fate determination. PLoS Genet. 11: e1005669.
. 2015. Localization and abundance analysis of human lncRNAs at single-cell and single-molecule resolution. Genome Biol. 16: 20.
. 2014. Evolutionary dynamics and tissue specificity of human long noncoding RNAs in six mammals. Genome Res. 24: 616–628. 2016. Long noncoding RNA: Novel links between gene expression and innate immunity. Virus Res. 212: 137–145.
. 2013. A long noncoding RNA mediates both activation and repression of immune response genes. Science 341: 789–792.
. 2013. LincRNA-Cox2 is a long noncoding RNA induced by TLRs that mediates both activation and repression of immune response genes. Cytokine 63: 251–251.
. 2011. Molecular mechanisms of long noncoding RNAs. Mol. Cell 43: 904–914.
. 2012. Uncovering the role of genomic “dark matter” in human disease. J. Clin. Invest. 122: 1589–1595.
. 2013. Structure and function of long noncoding RNAs in epigenetic regulation. Nat. Struct. Mol. Biol. 20: 300–307.
. 2015. Expression and functions of long noncoding RNAs during human T helper cell differentiation. Nat. Commun. 6: 6932.
. 2012. Cutting edge: influence of Tmevpg1, a long intergenic noncoding RNA, on the expression of Ifng by Th1 cells. J. Immunol. 189: 2084–2088.
. 2014. Regulation of the Th1 genomic locus from Ifng through Tmevpg1 by T-bet. J. Immunol. 193: 3959–3965.
. 2013. The NeST long ncRNA controls microbial susceptibility and epigenetic activation of the interferon-γ locus. Cell 152: 743–754. , et al. 2015. The long noncoding RNA IFNG-AS1 promotes T helper type 1 cells response in patients with Hashimoto's thyroiditis. Sci. Rep. 5: 17702.
. 2005. A strategy for probing the function of noncoding RNAs finds a repressor of NFAT. Science 309: 1570–1573.
. 2011. Dephosphorylation of the nuclear factor of activated T cells (NFAT) transcription factor is regulated by an RNA-protein scaffold complex. [Published erratum appears in 2011 Proc. Natl. Acad. Sci. USA 108: 17235.] Proc. Natl. Acad. Sci. USA 108: 11381–11386.
. 2015. The lncRNA NRON modulates HIV-1 replication in a NFAT-dependent manner and is differentially regulated by early and late viral proteins. Sci. Rep. 5: 8639.
. 2014. The human long noncoding RNA lnc-IL7R regulates the inflammatory response. Eur. J. Immunol. 44: 2085–2095.
. 2014. The long noncoding RNA THRIL regulates TNF alpha expression through its interaction with hnRNPL. Proc. Natl. Acad. Sci. USA 111: 1002-1007.
. 2014. Long non-coding RNAs and control of gene expression in the immune system. Trends Mol. Med. 20: 623–631.
. 2015. Long noncoding RNA derived from CD244 signaling epigenetically controls CD8+ T-cell immune responses in tuberculosis infection. Proc. Natl. Acad. Sci. USA 112: E3883–E3892.
. 2011. Kaposi’s sarcoma-associated herpesvirus noncoding polyadenylated nuclear RNA interacts with virus- and host cell-encoded proteins and suppresses expression of genes involved in immune modulation. J. Virol. 85: 13290–13297.
. 2012. KSHV PAN RNA associates with demethylases UTX and JMJD3 to activate lytic replication through a physical interaction with the virus genome. PLoS Pathog. 8: e1002680.
. 2014. A lytic viral long noncoding RNA modulates the function of a latent protein. J. Virol. 88: 1843–1848.
. 2015. DDX5 and its associated lncRNA Rmrp modulate TH17 cell effector functions [Published erratum appears as Corrigendum: DDX5 and its associated lncRNA Rmrp modulate TH17 cell effector functions. 2016 Nature 533: 130.] Nature 528: 517–522.
. 2010. Paraspeckles. Cold Spring Harb. Perspect. Biol. 2: a000687.
. 2013. Paraspeckle formation during the biogenesis of long non-coding RNAs. RNA Biol. 10: 456–461.
. 2014. Long noncoding RNA NEAT1-dependent SFPQ relocation from promoter region to paraspeckle mediates IL8 expression upon immune stimuli. [Published erratum appears in 2014 Mol. Cell 54: 1055.] Mol. Cell 53: 393–406.
. 2016. Long noncoding RNAs in innate immunity. Cell. Mol. Immunol. 13: 138–147.
. 2013. NEAT1 long noncoding RNA and paraspeckle bodies modulate HIV-1 posttranscriptional expression. MBio 4: e00596–e12.
. 2013. Chromatin, non-coding RNAs, and the expression of HIV. Viruses 5: 1633–1645.
. 2015. Promoter targeting RNAs: unexpected contributors to the control of HIV-1 transcription. Mol. Ther. Nucl. Acids 4: e222.
. 2009. Chromatin signature reveals over a thousand highly conserved large non-coding RNAs in mammals. Nature 458: 223–227.
. 2009. Many human large intergenic noncoding RNAs associate with chromatin-modifying complexes and affect gene expression. Proc. Natl. Acad. Sci. USA 106: 11667–11672.
. 2014. The evolution of lncRNA repertoires and expression patterns in tetrapods. Nature 505: 635–640.
. 2016. Rapid evolutionary turnover underlies conserved lncRNA-genome interactions. Genes Dev. 30: 191–207.
. 2011. Conserved function of lincRNAs in vertebrate embryonic development despite rapid sequence evolution. [Published erratum appears in 2012 Cell 151: 684–686.] Cell 147: 1537–1550.
. 2015. Principles of long noncoding RNA evolution derived from direct comparison of transcriptomes in 17 species. Cell Rep. 11: 1110–1122.
. 2012. Exploring cancer datasets in the integrative genomics viewer (IGV). Cancer Res. 72: 3968–3968.
. 2011. Integrative genomics viewer. Nat. Biotechnol. 29: 24–26.
. 2013. Integrative Genomics Viewer (IGV): high-performance genomics data visualization and exploration. Brief. Bioinform. 14: 178–192.
. 2016. Discovery and functional analysis of lncRNAs: methodologies to investigate an uncharacterized transcriptome. Biochim. Biophys. Acta 1859: 3–15.
. 2012. The GENCODE v7 catalog of human long noncoding RNAs: analysis of their gene structure, evolution, and expression. Genome Res. 22: 1775–1789.
. 2014. Genome-wide screening and functional analysis identify a large number of long noncoding RNAs involved in the sexual reproduction of rice. Genome Biol. 15: 512.
. 2007. CPC: assess the protein-coding potential of transcripts using sequence features and support vector machine. Nucleic Acids Res. 35: W345–W349.
. 2013. CPAT: coding-potential assessment tool using an alignment-free logistic regression model. Nucleic Acids Res. 41: e74.
. 2016. Evolutionary analysis across mammals reveals distinct classes of long non-coding RNAs. Genome Biol. 17: 19.
. 2011. PhyloCSF: a comparative genomics method to distinguish protein coding and non-coding regions. Bioinformatics 27: i275–i282. Chu, C., J. Quinn, and H. Y. Chang. 2012. Chromatin isolation by RNA purification (ChIRP). J. Vis. Exp. (61): 3912.
. 2015. Analysis of long-noncoding RNA interaction at chromatin by chromatin isolation by RNA purification (ChIRP). Cancer Res. 75 (15 Suppl. ): abstract nr. 4881.
. 2015. The Xist lncRNA interacts directly with SHARP to silence transcription through HDAC3. Nature 521: 232–236.
. 2015. RIP-Seq data analysis to determine RNA-protein associations. Methods Mol. Biol. 1269: 293–303.
. 2015. RNA antisense purification (RAP) for mapping RNA interactions with chromatin. Methods Mol. Biol. 1262: 183–197.
. 2015. Nuclear fractionation reveals thousands of chromatin-tethered noncoding RNAs adjacent to active genes. Cell Rep. 12: 1089–1098.
. 2016. Unique features of long non-coding RNA biogenesis and function. Nat. Rev. Genet. 17: 47–62.
. 2016. 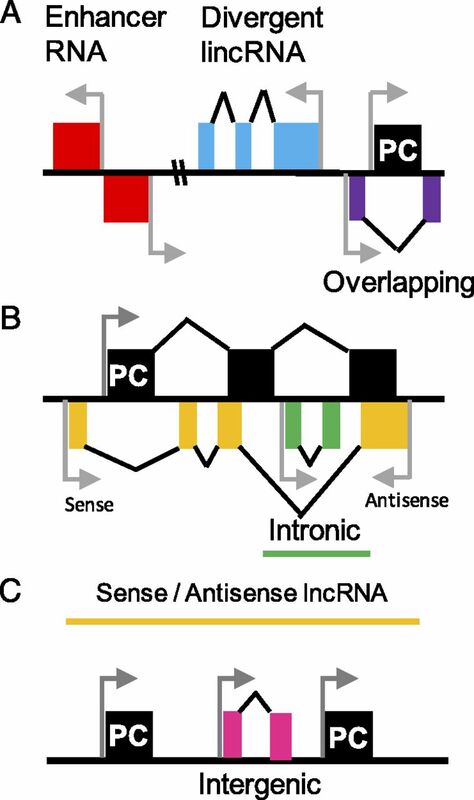 Enhancers as non-coding RNA transcription units: recent insights and future perspectives. Nat. Rev. Genet. 17: 207–223.
. 2013. eRNAs promote transcription by establishing chromatin accessibility at defined genomic loci. Mol. Cell 51: 606–617.
. 2013. Predicting enhancer transcription and activity from chromatin modifications. Nucleic Acids Res. 41: 10032–10043.
. 2015. The selection and function of cell type-specific enhancers. Nat. Rev. Mol. Cell Biol. 16: 144–154.
. 2013. Towards an understanding of cell-specific functions of signal-dependent transcription factors. J. Mol. Endocrinol. 51: T37–T50.
. 2015. New roles for DNA cytosine modification, eRNA, anchors, and superanchors in developing B cell progenitors. Proc. Natl. Acad. Sci. USA 112: 12776–12781.
. 2012. Noncoding transcription at enhancers: general principles and functional models. Annu. Rev. Genet. 46: 1–19.
. 2011. [Long non-coding RNAs with enhancer-like function in human cells]. Med. Sci. (Paris) 27: 359–361.
. 2013. eRNAs are required for p53-dependent enhancer activity and gene transcription. Mol. Cell 49: 524–535.
. 2014. Long non-coding RNAs and enhancer RNAs regulate the lipopolysaccharide-induced inflammatory response in human monocytes. [Published erratum appears in 2015 Nat. Commun. 6: 6814] Nat. Commun. 5: 3979.
. 2014. Long non-coding RNAs and enhancer RNAs regulate the lipopolysaccharide-induced inflammatory response in human monocytes. Nat. Commun. 5: 3979.
. 2015. Long non-coding RNAs and enhancer RNAs regulate the lipopolysaccharide-induced inflammatory response in human monocytes (vol 5, 3979, 2014). Nat. Commun. 6: 6814.
. 2015. Long non-coding RNA BST2/BISPR is induced by IFN and regulates the expression of the antiviral factor tetherin. Front. Immunol. 5: 655.
. 2014. Genome-wide mapping and characterization of Notch-regulated long noncoding RNAs in acute leukemia. Cell 158: 593–606.
. 2013. Super-enhancers in the control of cell identity and disease. Cell 155: 934–947.
. 2013. Master transcription factors and mediator establish super-enhancers at key cell identity genes. Cell 153: 307–319.
. 2013. Discovery and characterization of super-enhancer-associated dependencies in diffuse large B cell lymphoma. [Published erratum appears in 2014 Cancer Cell 25: 545–546.] Cancer Cell 24: 777–790.
. 2015. Inhibition of super-enhancer activity in autoinflammatory site-derived T cells reduces disease-associated gene expression. Cell Rep. 12: 1986–1996.
. 2011. BET bromodomain inhibition as a therapeutic strategy to target c-Myc. Cell 146: 904–917.
. 2015. Super-enhancers delineate disease-associated regulatory nodes in T cells. Nature 520: 558–562.